Metsä Board has introduced a new paperboard cup design concept, known as Lidloc, which eliminates the use of separate lid. Launched at the recently held Packaging Innovations Exhibition held in Birmingham, UK, the newly developed patented design is based upon an extension to a standard cup structure that folds and locks into an integrated lid. In addition to eliminating the use of a separate plastic lid, the packaging design offers a new insight into the production, consumption and recycling of paperboard cups. Metsä Board design and innovation director Cyril Drouet said: “We have designed this to be a one-piece construction that removes the need for a separate plastic lid. “It is easy to fold and assemble with a secure lid-locking design. Metsä said that the packaging design’s integrated lid is spill proof. It can also offer extra branding power as it allows for printing as one piece with the rest of the cup. With the Lidloc design, Metsä Board said it is offering sustainable and innovative packaging solutions for its customers to enhance their brands. Currently, Metsä Board is using a renewable resource, fresh fibres, to produce its paperboard products, which include folding boxboards and white linerboards. The fresh fibres are sourced from known origin and can help ensure purity and brightness of appearance. 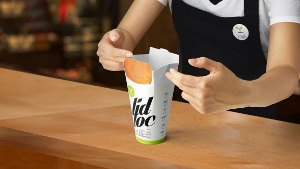 Image: Metsä Board’s Lidloc paperboard cup design. Photo: courtesy of Metsä Board.